Dietrich Varez (born 28 March 1939) is an iconoclastic printmaker-painter. 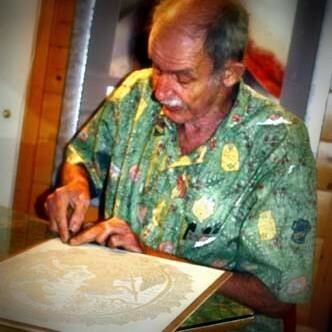 His work is among the most widely recognized of any artist in Hawaii. 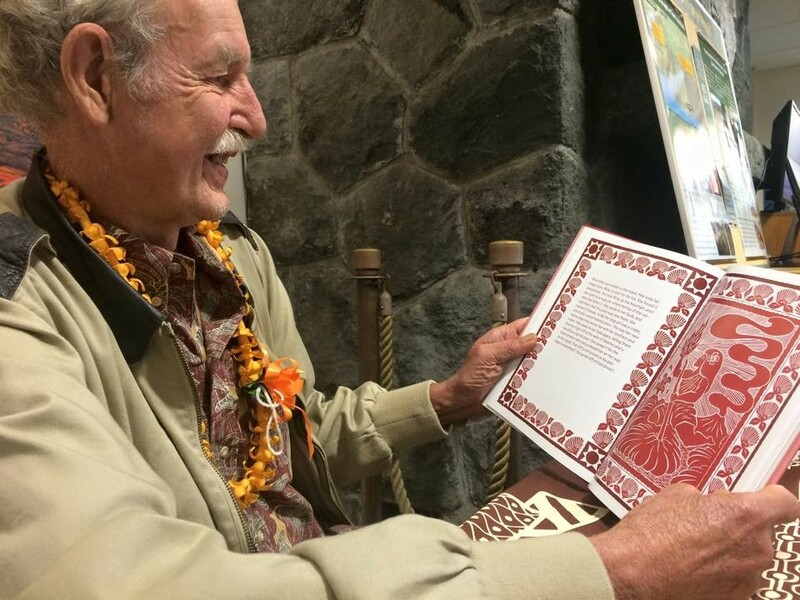 Dietrich finds inspiration for his art from Hawaiian folklore and the natural beauty of the native 'ohi'a rain forest surrounding his home located in a remote area of Volcano, on the Big Island of Hawai'i, where he lives with his wife Linda ( also a noted painter ). DIETRICH VAREZ first came to Hawai'i at age 8, when his mother married his stepfather Manuel Varez. After the war-torn Germany he'd known, it was love at first sight, and his romance with Hawaii still grows. Shunning publicity and working in the simplest possible fashion with linoleum blocks or canvas, Varez continually shapes his strong personal expression of Hawai'i. The Hawai'i of old - when spirits inhabited every tree and stone, and gods walked the earth - is Dietrich's inspiration. His work boldly traces the adventures and passions of a cast of mythical characters he has carefully researched in legend. He lovingly and faithfully depicts Hawaiians practicing the arts, skills, and values of Hawai'i, old Hawai'i lifestyles and legends, in all of his prints, illustrated books, and vibrant oil paintings. 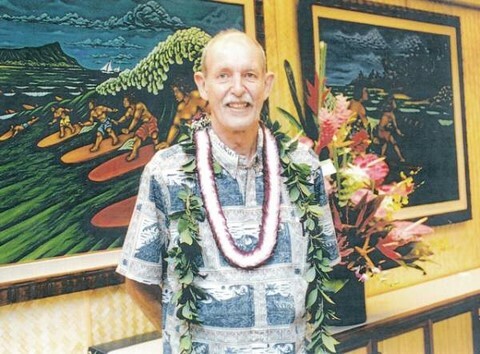 Dietrich is one of the Big Island's most beloved artists. Varez was born in Berlin, Germany, at the start of World War II. His father, an architect and engineer of Lithuanian heritage worked on military construction. His mother Ursula, was a Polish-Swedish translator of English. As the war ended, Varez’s father left his family to fend for themselves and he went into hiding from occupation forces, a period Varez has said was “pure misery.” Ursula divorced in 1947. In 1948, she married U.S. Army Sgt. Manuel Varez, who adopted her sons, Dietrich and Christopher, and brought the family to his home in Oahu, Hawaii. Dietrich graduated from President Theodore Roosevelt High School in Honolulu and from the University of Hawaii with a degree in English. He enlisted in the U.S. Army in 1962, earning the rank of second lieutenant, and then served in the Army Reserves in Honolulu while earning a master's degree in English at the University of Hawaii. He married Linda Denneberg, a native of California who had come to Hawaii as a competitive surfer and stayed to become an artist, in 1965. Varez, with his wife Linda and recently born son, moved to the Big Island in 1968 after purchasing a 9-acre (36,000 m2) property near Kilauea Volcano, sight unseen. For several years, the family lived in cabins at the Hawaii Volcano National Park, or in a tent on their land, supported by Varez’s groundskeeping job at a nearby golf course or as a bartender for the Volcano House, the 1877 lodge in the National Park overlooking the caldera of Kilauea Volcano. He supplemented his earnings by carving firewood scraps with the image of Pele, Goddess of the volcano, which he sold at the bar, and later he made woodblock prints, mostly giving them away but selling some in the lodge gift shop. In 1974, the nonprofit Volcano Art Center opened, providing increased visibility for his work. Varez prints became increasingly popular, eventually allowing Varez to earn a living as an artist. Varez has published more than 225 wood- and linoleum-block prints. The subject matter in most of Varez’s work is inspired by traditional Hawaiian legends, integrating mythological figures in scenes with flora and fauna typical of the diverse Hawaiian environment. 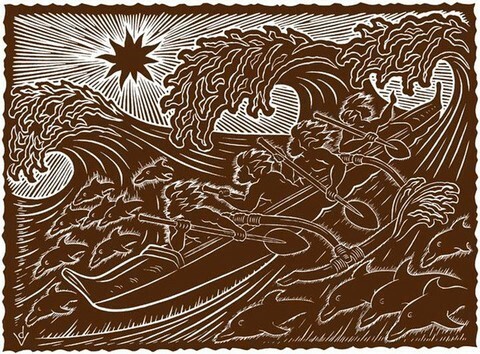 His work is informed by graphic interpretations of traditional Polynesian designs, as seen, for instance, in Hawaiian quilts, and is especially rich in imagery from the Hawaiian rainforest. However, Varez has stated that he actively avoids other art that might influence the unmediated nature of his vision. His recent graphic work has branched out to include more modern stories, notably that of Father Damien, known for his work in the leper colony on Molokai, and also the renowned battleship USS Missouri (BB-63), berthed at Pearl Harbor, the U.S. Naval base on Oahu. Varez has also adapted prints to fabric for a line of Hawaiian shirts with clothing maker Reyn Spooner, and he has also painted in oils on a limited basis. The newest addition is that he has authorized his use of artwork and adaptions thereof to Aloha Accents in Volcano, Hawaii for exclusively creating beautiful jewelry and home accents. 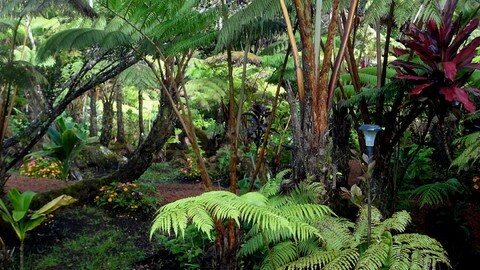 The studio where Varez works and lives is in a rural forested area near the small town of Volcano, Hawaii a few miles from the entrance to Hawaii Volcanoes National Park. He built the house himself after many years of living in tents or cabins on the land or in the Park. For most of his life there, he and his family have lived a self-sufficient pioneering life. They capture rainwater for their needs, and had no electricity for thirty years. The road to his home has been described as “barely passable.” Varez and his wife rarely leave their homestead, virtually never travelling off-island. Varez, as a self-taught artist whose career developed outside framework of the institutional art world, maintains a strict policy of keeping prices low and distributing directly to the widest audience. This is consistent with his earliest practice of giving away prints, and only then, when demand required it, of charging nominal prices to cover his expenses. It was only after several years of a growing reputation that he decided to make his living from the sale of his work, and he has expressed in interviews a deep ambivalence toward being considered a professional artist. Contrary to the usual practice among printmakers, he refuses to limit his editions, printing until a block is exhausted. He dates his prints according to when the print was struck, not, as is customary, when the block was carved. These individualistic practices may have limited the value of his work to collectors, but Varez has said he is committed to staying outside the artificial boundaries of art world conventions. "The printmaking business needs some new blood and new traditions,” he has been quoted as saying. Burnett, John (12 April 2002). "Legends take form: Volcano artist puts images and words to Hawaii gods, goddesses". Hilo, Hawaii: Hawaii Tribune-Herald. Retrieved 12 March 2010. Jacobs, Ron (February 1991). "Prince of Prints: Dietrich Varez Emerges from the Art Jungle". Hawaii Magazine. Retrieved 12 March 2010. Thompson, David (Oct–Nov 2005). "The People's Printer". Hana Hou! The Magazine of Hawaiian Airlines. Retrieved 12 March 2010. Spence, Steve (23 September 1979). "The Artist in Isolation". Sunday Today. Honolulu, Hawaii: The Star-Bulletin. Retrieved 12 March 2010. Adamski, Mary (15 May 2009). "Art commemorating canonization adds Hawaiian cultural elements". Retrieved 17 April 2010. Adamski, Mary (15 May 2009). "Inspired by Damien". Star Bulletin. Retrieved 17 April 2010. "Mighty Mo as envisioned by Artist Dietrich Varez". Hawaii Tribune-Herald. 21 June 1998. Retrieved 12 March 2010. 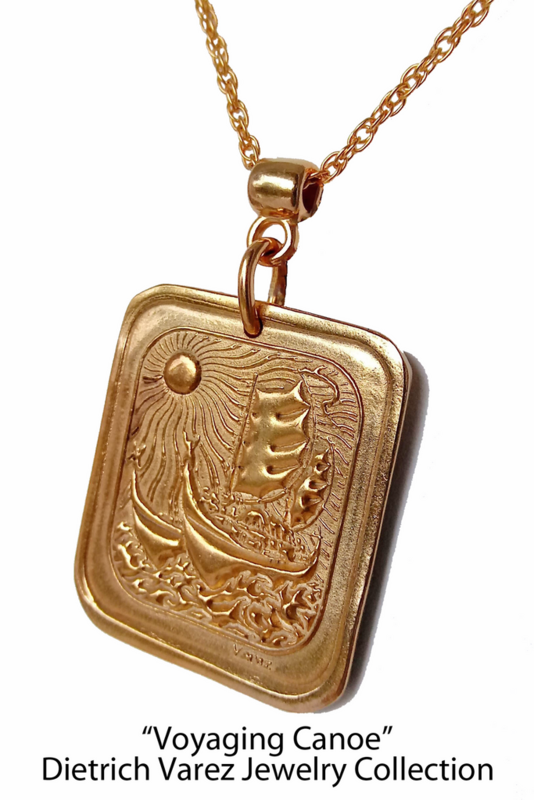 About 925 Sterling Silver, Vermeil, Bronze, Copper, 14K or 18K Gold. © Copyright Aloha Accents, 2017-2018. All Rights Reserved.